"We, the people of All Souls, are a caring community, learning, growing and worshipping together in Christian faith. All Souls in the 1930s. The first All Souls church of Gypsy Village (now Sandringham), was a wooden building constructed in Queens Square, on nearly an acre of land thought to have been presented by local landowner and philanthropist John Matthew Smith (1815-1898). Smith also donated £400 towards the erection of the original building, and in addition paid for all the inside fittings, seating and lighting, as well as the harmonium. The first service in the new church building was conducted by the Rev'd. E. C. Spicer on 2nd November 1881 - All Souls Day. In 1904, the wooden church was moved to the present site at 48-50 Bay Road. 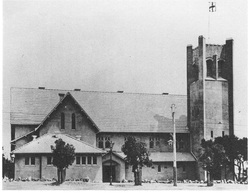 After the First World War, the wooden structure was re-sited on the same land to allow the concrete church to be built. 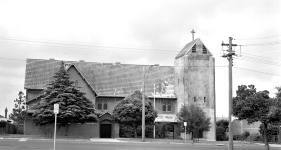 The church is believed to be the first reinforced concrete church in Australia, built at the cost of about £10,000, with the foundation stone laid on 7th September 1919. It was consecrated on 10th December 1921 and the first services were held in it the next day. A Tennis Club was formed in 1927. It was established and opened its own courts on 2 February 1929 in Rose St., Sandringham. The clubhouse was erected in 1935. In 1938, a branch of the C.E.M.S (now the Anglican Men's Society) was formed. A shop adjacent to the church was purchased in 1957. It was fitted up and established as the All Souls Opportunity Shop. This proved to be a successful and profitable venture. Today it continues to raise tens of thousands of dollars for charity each year. The Garden of the Resurrection: On Mothering Sunday, 25 March 1979, The Garden of Resurrection and its complimentary Book of Remembrance were dedicated. 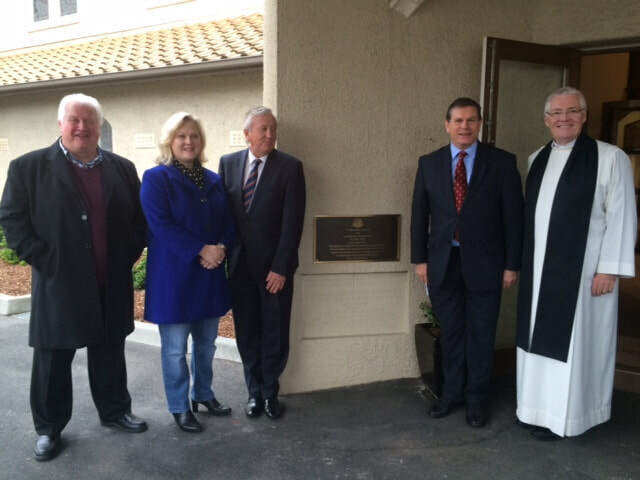 On Sunday 30 October 2005, a new extension was dedicated by Bishop John Wilson. The new facilities included an extension to the existing lounge area, updated kitchen, meeting rooms and a small lounge downstairs.